Thank you for opening your home. 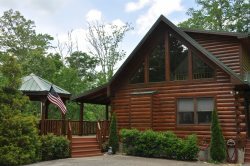 We have stayed in many cabins and yours is by far the nicest! Best furniture, mattresses, and dishes. Great taste in dcor and plenty of extra supplies. Had a magical time! We have really enjoyed our stay! Everything was wonderful and we loved the cabin. Thanks so much! We enjoyed our stay in your beautiful home. We had so much fun riding the Polar Express! We can't wait to return!! I had a wonderful time at the cabin, it was beautiful. It's just so peaceful and quiet. Hope to come back. The cabin exceeded my expectations. It was beautifully furnished with the bear dcor. Very functional and beautiful views. Warm gas fireplace. Although we brought a lot of our own supplies, it was stocked with basic items that we would need right away, i.e., paper towels, garbage bags, etc. Most comfortable beds I've slept on for a long time! We went on the first week of December and were welcomed with an unexpected winter storm which yielded about 8 inches of snow. Beautiful winter wonderland type of views. Agency team members all were very helpful and friendly. I will definitely return.